Totally nerding out over these geometric pillow cases. The dude in me doesn’t often think about creative bedding options but as a fan of good design, this hits the spot. Screen-printed with water-based ink and made in the good ole US of A. A while back my friend Angella d’Avignon posted a series of photos on her Facebook labeled Southern California. They were wonderful. While I swear that every part of the world has its own unique lighting, I’ve always been drawn to the way photos from that part of the country look. It didn’t hurt that she shot on film and blends street photography with visions of endless summers, backyard gatherings and road trips – you know, some of my fondest memories. So I asked Angella to pare down her collection to 50 favorites and to share and a bit about the series. You’ll find her answers below. I’ve always taken photos for sport and it comes and goes in my life (it can be very, very absorbing) but i’ve always relied on it as a therapeutic practice and a creative tool. It’s sort of like taking notes. Who/what influences the style of photos you take? I’m definitely inspired by the more noted street photographers from the 60s and 70s – William Eggleston, Stephen Shore, Bruce Davidson, Gerry Winogrand, the pioneers if you will. And since Southern California is already such a beautiful landscape, San Diego especially, I found that I was drawn toward the smaller scenes and weird details and that taking a picture of them was a way to point them out and be active in observation. What camera did you you shoot this series on? All of these photos were taken with a Yashica FX-3 35mm SLR camera from the 70’s (found it at Amvets!) between Spring 2011-to present. It’s got a light leak and it’s beat up, but i love it. Plus I broke my Lomo LC-A that i carried around for 6 years, so it was time for something new (old). Angella is also a contributor to Helmuth Projects and Sezio. If fifty shots wasn’t enough for you, check out her full series or her Instagram. 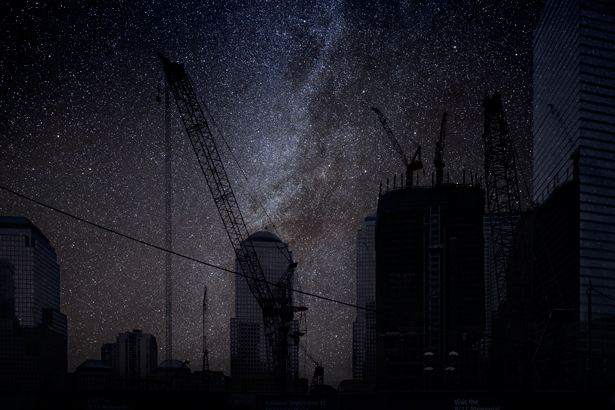 Sometimes, walking around, surrounded by the city spectacle, I forget what a full night sky looks like. It takes a keen mind and a diligent eye to remember they’re up there. That, or frequenting somewhere much less light polluted. 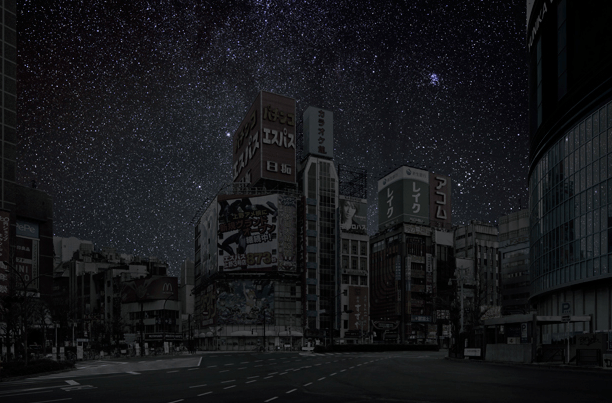 I guess that’s why I’m drawn to Thierry Cohen’s project, Darkened Cities. 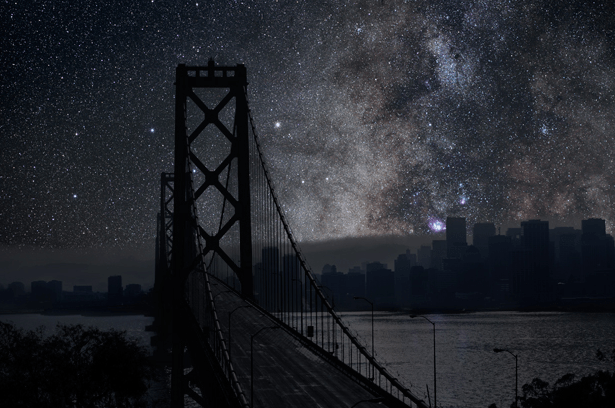 I really love his idea – by stripping light from cities he actually makes the sky shine. A vivid view into your normally obscured night: the buildings, hanging there, less brilliant, sit irrelevant against the large universe. It reminds me of how little we are. In a good way. Check out a few of the Holiday Matinee skylines – sans lights – below. Then, check out the rest on his website. Because what good are stars if you don’t even take the time to appreciate they’re up there? And now for a video that will warm your heart and leave you smiling. As part of a Skillshare class she was taking, Michelle Newman made a motion portrait of her 89-year-old landlady, Carol Lyn Black lip-syncing her favorite song Happy Days Are Here Again. Take a look at how happy Carol gets during the chorus of the song – it’s infectious! Ready for some fun facts? The original version was FDR’s 1932 Presidential campaign song and we also may have celebrated the Repeal of Prohibition with it. Hooray! Thanks to Sarah Palmer for originally sharing the link on my Facebook wall. Charles Eisenstein’s Sacred Economics changed my life. I know that’s high praise and I certainly wouldn’t have expected anything with economics in the title to do that for me, but it did. So what the hell is this book about that I’m raving over? It’s about how our current money system is deeply troubled and how it has to change. How our perspective that any economic growth is always a good thing is actually degrading our quality of life. But most of all how a shift has already started, what we can do to prepare for it and why we should be stoked as ever that it’s happening. Negative interest economics, artificial scarcity, gift culture. To be honest, it’s incredibly difficult for me to mention all the ideas covered in this book and I think it would be fruitless for me to try to explain it all here. What I will say is that there’s a great connection between all of this and moving people away from tedious work to allow them to do truly important work, the work that they love. It heals the planet and builds community. That’s something we’ve always been about encouraging. Roughly halfway through the book I found myself applying what I learned from Eisenstein to my daily life. Though he doesn’t specifically ask the reader to do any of this, I found myself as insistent as ever to buy local, finally got involved with Kiva loans and continually asked myself how I could be more giving. These were ways I could participate in something I was really starting to believe in. I’m convinced the ideas in this book are important for more people to grasp if we’re serious about evolving and transitioning into a new and better era.The short film below is what originally motivated me to read the book, so that’s an excellent start to gauge whether you’d be interested in what Charles has to offer. I found his writing engaging and was impressed that he took every opportunity to consider other viewpoints and his critics. If you do in fact want to take the next step, I will personally gift a hard copy to two readers that are excited to check this out. Just leave a Facebook comment below saying why you are psyched to learn more. You can also read the book online or pick up as a physical copy or eBook. Charles even has several TEDx talks and other titles that you may be interested in.